In the coming months, means to develop healthier, stronger organizations will be examined. While West Texas A&M University and WT 125: From the Panhandle to the World are the basis for these reflections, the thoughts may have value in many settings. Principles that guide an effective vision are the result of a healthy organizational culture. Strong organizations become even stronger when there are openly shared, commonly held, deeply important, and widely applicable principles at work in every corner of the enterprise. This holds true for the U.S. military as well as the corner grocery store. Service: A corollary to this aspect of organizational health is that in order to love people you must serve them. Superficial appreciation of this principle might lead shortsighted thinkers to believe that you must get something back from the people serving in and served by the organization. A deficit ledger is kept. Instead, a heart of service looks to give rather than get. Such a heart-set ensures that people and service to them are first priority. Organizational health follows. When you serve people, you don’t get something back, you get everything back. In a university, learner-centeredness is essential. Some in higher education have adopted a customer service mind-set. It is close, but not identical. A healthy organization with a positive view to a strong future treats every individual as a learner. This is achieved by simply valuing the perspective of everyone on campus whether a student, plumber, faculty, secretary, guest or alumnus. Purpose: Understanding organizational purpose allows members, workers by any other name, to see how their contributions lead to organizational effectiveness. 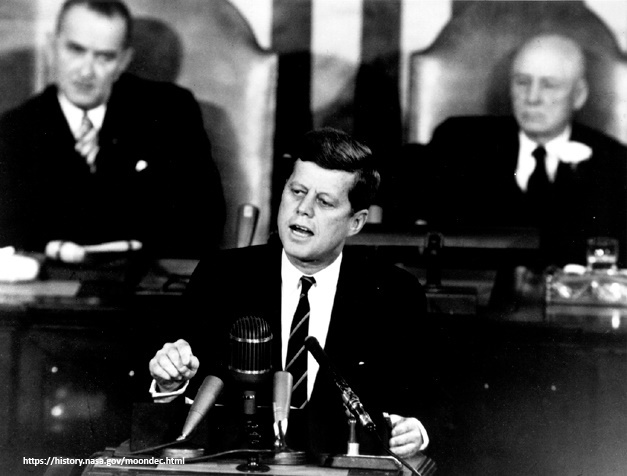 Following his “Moon Shot” speech to Congress on May 25, 1961, President Kennedy visited NASA. He met a man in a hallway carrying a broom and walking with determination. The President asked him about his job. I do not believe the janitor recognized him—it was all very casual. The man replied, “I am helping put a man on the moon.” President Kennedy probably thought – with passion like this, we will prevail. If, on a university campus, we believe that providing educational opportunity might allow someone to become a great teacher, a leading scientist, a gifted artist, a skillful engineer or a caring nurse, the organization is working in a healthy way. It is my hope that the woman mowing the lawn in front of my office understands how her work contributes to those outcomes. Uniqueness: A healthy organization understands that strength grows through distinctiveness, and without it an organization wanders. Appreciating unique strengths allows a place of purpose to sharpen itself, not in comparison to other organizations, but by internal reflection that leads to productive focus. This does not undermine the value of comparisons to peer organizations. Benchmarking provides perspective on how to be both unique and a member of a “family” of effective organizations. Niches create value, and distinctiveness follows. Place: According to Ross DeVol of the Walton Family Foundation, all organizations have geographic impact and, likewise, are products of geography. Even in a geographically-detached organization such as Amazon, serving ubiquitously through digitally-powered communication, corporate locale has driven arguments and posturing in Washington, D.C., and New York City. These two cities received B-grades in the initial scaling of 19 cities, but they have moved to the top of the list. Being responsive to and reflective of the location of any enterprise powerfully shapes organizational futures. In the case of universities, I believe there is not a poor location. It is the job of leadership to find the strengths of geography and cultivate those strengths for individual and organizational benefit. If an organizational culture apologizes for its location or longs to be somewhere else, it is perpetually in an unhealthy state. A forward-looking organizational perspective is hard to attain. However, a well-executed vision creates a strong sense of purpose and organizational health and should be feverishly pursued.